With spring starting next week, Osage City Parks and Recreation activities are peeking into summertime with youth baseball and softball and tee-ball signup deadlines approaching, lifeguard, water safety instruction, and CPR certification classes scheduled. And with spring here, that means smoke will follow, as in Smoke in the Spring, the annual barbecue weekend in Osage City, April 7-8, 2017. Players who are not 5 years old by May 1, 2017, are too young for the Novice Boys and Girls Divisions. The U10 Divisions (Midget, Boys and Girls), U12 Divisions (Pee Wee Boys, C-Girls), U15 Divisions (Little League Boys, B-Girls) are kid-pitch. Team practices can start the week of April 17, if a coach has been assigned. FHL Season will be May 22 through July 7. Divisions Tournaments will be the week of July 10. Baseball and Softball Age Date, May 1, 2017. 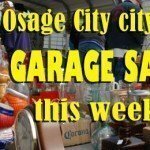 Sign-up forms are available at Osage City Hall, online at www.osagecity.com, sent through USD 420 schools, and the City of Osage City Facebook Page. Signup deadline, March 31, 2017. For children age 3, 4, 5. Players need to turn 3 by May 1, 2017 to participate. OCPR tee-ball is a parent interactive program, meaning all parents are invited to help with this program. Tee-ball coaches are in charge of each game, making sure player positions are rotated and the batting order is set. A Head Coach is selected by OCPR and the remaining parents serve as assistant coaches for the team. Each team has a roster limit of 10 players. Games are 45 minutes or 3 innings. Each team bats everyone and then players rotate to the field for defense. Team practice can start after the deadline, once teams are put together and a head coach is assigned. Games begin the week of June 5. Teams play 6 games, game dates are to be determined, based on the number of teams participating. Game times are 6 p.m. or 7 p.m.
A game schedule will be sent out a week prior to the start of the season. Signup deadline, May 12, 2017. 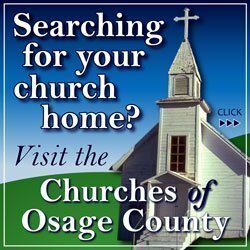 All classes are held at the Osage City Aquatic Center. For more information contact, Lynn Tice 785-249-2199, [email protected]. May 18-20, 9 a.m.-5:30 p.m.
Students will be given a break for lunch. Must be 18 to take the class. Deadline is April 28, 2017. May 24-26, 9 a.m.-5:30 p.m.
May 27 and 28, 9 a.m.-12:30 p.m.
Includes First Aid and CPR. Must be 15 to take the class. Signup deadline May 5, 2017. May 29-31 and June 6-9, 8 a.m.-12:30 p.m.
Must be 16 to take the class. Signup deadline May 12, 2017. May 22, 9 a.m.-2 p.m.
Instructors, Lynn Tice and Jordan Tice. Deadline is May 19, 2017. 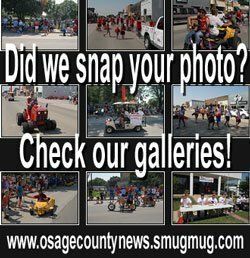 Smoke in the Spring – April 7-8, 2017 – Jones Park, Osage City, Kan.
BBQ Bucks can be purchased at either Osage City Hall or Edward Jones starting April 3. BBQ Bucks will be sold onsite April 7, 12-7 p.m., at the Community Building concession stand windows. BBQ Bucks can be reused from year to year. Just Passin Through is a high energy country/honky tonk dance band from eastern Kansas, that will keep any crowd entertained with hits from country artists, blues and rock and roll. Band Members: Jay Dee Meers (lead vocal), Noel Young (vocals), Rex Peterson (keyboard and vocals), Justin Kistner (fiddle and rhythm guitar), Rick McClintic (lead guitar), Russel Wolf (bass and vocals), Mark Paquette (drums). Booking information, Generation Relevant, J.D. Linn, agent, 913-808-7911, [email protected]. Provided courtesy of Garrett’s Fireworks, Osage City, Kan.
Signup deadline April 7, 5 p.m.
Kids-Q cook’s meeting April 7, 5:30 p.m., Community Building. Kids-Q Turn-In, April 7, 8 p.m. in the Community Building. Age divisions, 10 and under and 11 and above. Cookers must prepare their turn-in on site. Shuttle Service (Friday Only) for those parked at the Osage City School Parking Lot Area (4-9pm), pick up at Osage City Elementary parking lot, and drop off will be at Safford, between K-170 and 1st Street. Patrons are also welcome to walk to the event from the Osage schools. Open lot west of highway K-170 (Across from OCHS Football Field).